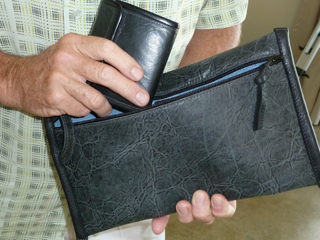 I designed this man's bag/pouch to go with the classic Leather Waves mens wallet that I've been making for years. 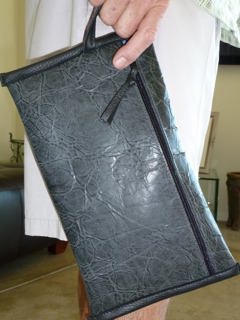 The Pouch is fully lined with recycled denium which gives it weight and body and a masculine flavor. I've got them in black, brown, verigated brown/black combination and olive. 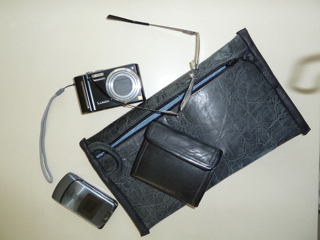 The wallet is shown in detail in the Small Accessories Category. 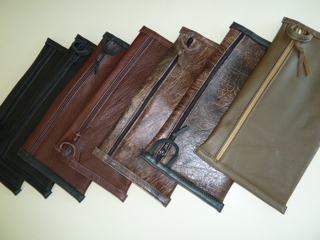 I also make them in "no animal leather" (find examples of finished Black and Paisley Brown under that category). I have also made a few specifically for women that are tapestry, leather or "no animal leather" with bright and cheerful unique linings (find examples in Womens Leather, and Purses/Bags, and Small Accessories categories). 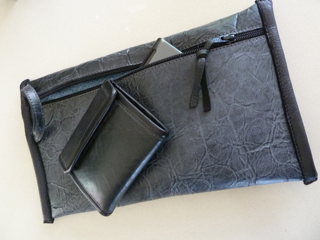 The price here is for the Leather Envelope Pouch/Bag. Most colors are Available Now but you may also Custom Order both pieces in many other colors and textures.